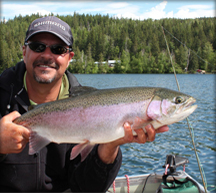 Our ice fishing charters are usually underway by mid December and typically continue through until late March. We target Rainbow Trout, Perch and Brook Trout with the use of an underwater camera system that allows us to see the fish. On the cooler days or if the wind should come up we use a six man ice fishing hut for a more comfortable day. 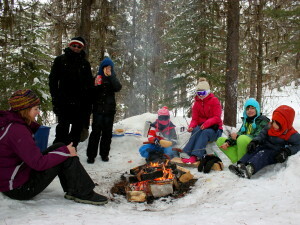 We keep a hot blazing fire on shore for our guests and included in your fishing charter is a hot lunch of smokies roasted over the fire, snacks and hot chocolate. Our Australian guests tell me they call smokies, snags…I like that better than smokies! 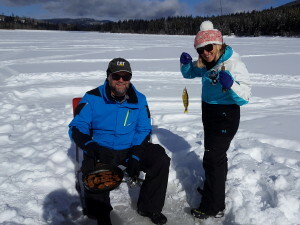 When fishing for Perch we can also do a breaded Perch fry right on the ice! You just gotta catch’em! 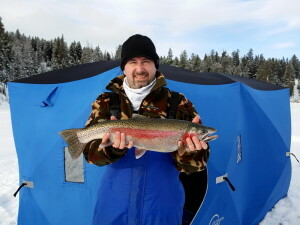 Should you decide to keep some fish we will clean and bag for you at the end of your ice fishing charter. If you’ve never ice fished before, I recommend you give it a try. It’s a great way to get out and enjoy the great outdoors during the winter. 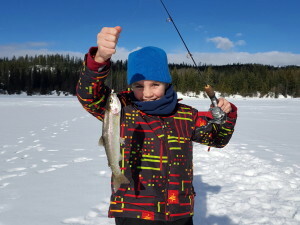 Our ice fishing charters are suited to the young and old alike and we can accommodate up to 4 anglers. If your group is larger than 4 just let me know and I will arrange for one of our guides to help out with transportation and fishing. 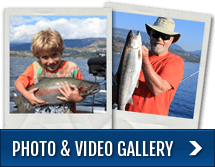 For your ice fishing charter we’ll meet in West Kelowna at 8 am and return by 5 pm. If you are in town on a skiing holiday at either Big White or Silver Star we will try to make the necessary arrangements to meet closer to your resort but sometimes this isn’t possible and you’ll need to provide your own transportation from the ski hill to West Kelowna where we’ll meet and then proceed to the mountain lake. From here your guide will take you to your destination lake and depending on the snow conditions and what lake we are fishing we’ll either drive right to the lake or park our truck as close to the lake as possible and snowmobile the rest of the way in. Once at the lake we’ll use our gas powered auger to drill an 8″ hole through the ice and depending on the time of year, this can be as thick as 30″. Once the hole is cleaned and water depth measured, we’ll set up the rods and start jigging! We use an assortment of baits such as meal worms, maggots, shrimp and dew worms. Our rods are loaded with tungsten jigs, Gibbs spoons, flys and bass tubes in the 1″ and 2″ size range.